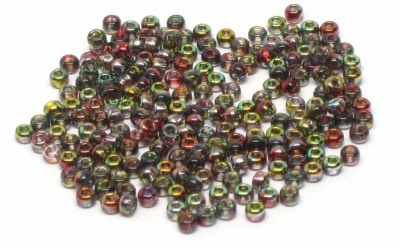 These are a new type of Miyuki beads called Union beads (or sometimes Fusion beads). 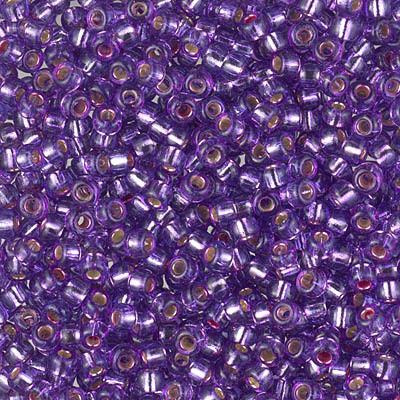 Uniting Japanese quality and Czech beauty, these are Miuuki seed beads made in Japan that are then sent to the Czech Republic to be coated with beautiful Czech Glass finishes. Please note: we asked about durability of these finishes. Here is what we were told: "All finishes “hold up” but are in no way permanent finishes but are very popular coatings that can withstand “normal” usage. Not exposed to extreme sun, sweat or perfume, they will do fine." These are called Magic Apple and are a wonderful melody of reds (roses actually) and greens, combined with a few silver and gold tones as well. Quite a striking metallic look.